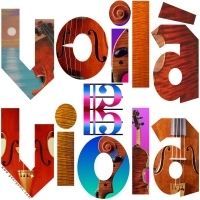 This bold and colorful “Voilà Viola!” design features different viola images within the letters that form the text, and an alto clef in the center. It will make a great gift for any viola player, teacher, student or lover of the instrument. Buy this design now on any t-shirt, hoodie, tote bag, mug or other quality giftware or apparel item, exclusively from Bratsche’s Viola Bazaar!